This topic discusses a variation of the Drama Workshop called "Newsroom." "Newsroom" is a "play" or drama that uses the format of a television news show as its template. It's a format kids know and teachers can easily slip into. 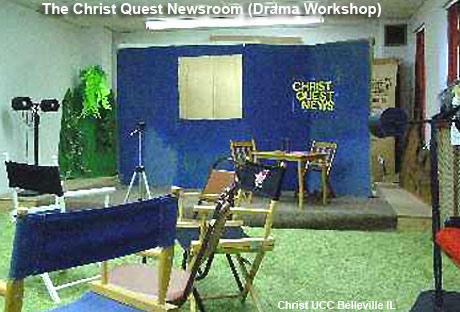 Typically you'll have newscasters reading from scripts at a news desk, and reporters "in the field" (standing off to the side in front of a backdrop) interviewing the characters in the Bible story that's being reported. "Studio" props, such as, lights and microphones, help outfit the room. The format offers both the opportunity to retell the story, but go deeper into each character's point of view and motivation. "I'm here with David, looking over at the Philistine army. David, how are you feeling right now?" See my Kingdom Parables Newscast Lesson for notes on how we set up our newsroom, videotaped it using an iPhone camera, and ran our "teleprompter." We've started a "Newsroom" workshop we call WHPC-TV (HPC = initials of our church). "Newsroom" is a series of skits that uses the format of a television news broadcast. It has simple staging and the added fun of a videocamera, microphones, quick backdrops, props, people dressed up as characters in the story, and the fun opportunity to see ourselves doing the drama afterwards. The teacher or savvy student runs the camera (typically an iphone on a tripod or selfie stick). You "pause" the recording in between scenes, reports, etc. If your scenes are noisy or far from the camera, it helps to have a powered microphone too (which the camera's microphone can pick up. A microphone plugged into a small guitar amp works fine. Otherwise, most smartphone microphones work fine IF the actors speak up. Creating the script is something we do a little bit ahead of time, and then have the kids flesh it out as part of their Bible study. Reporters typically ask questions, and the person being interviewed prepares their answer in advance. If needed, responses can be written on a flip chart (cue card). 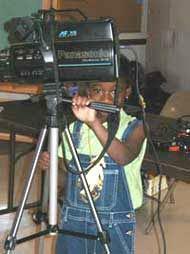 "Scripts" are typically printed, but we've also created "teleprompters" so that the kids are looking up at the camera, rather than always looking down. (1) Enlarged scripts taped to the wall behind the camera or on a flipchart. Or (2) Projecting the script on a large monitor or using an LCD projector hooked up to a laptop and projecting on a screen or wall behind the camera. 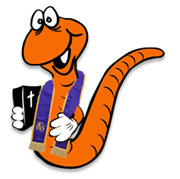 A helper "scrolls" the doc on the screen. This gets everyone looking up. In this particular newsroom photo, the microphone is just a prop. The girls are looking up at a script we projected on the wall. Interviewing Goliath and David was one of our first "News" shows we made. Just a thought that came from our local Science Museum: Creating a background panel with three panels, the largest in the center with the anchor desk in front. One of the side panels could have a large Biblical map for a reporter to indicate where the "action" is located (Similiar to the weather maps on the news.) The other side could have changing Biblical scenes, depending on the story. (cityscapes, close-up of The Temple, walls of Jericho, etc.) An idea never used, but it might work. We have a room like that, too and used it for on-the-spot interviews of Jesus and others when we did the story of Jesus and his family visiting the temple. We had the kids interview Mary and Joseph, and others along the way as they tried to locate Jesus. We videotaped it and then played it back for them. As the weeks went by, they enjoyed seeing the productions of the other classes, too. How much did you SCRIPT and how much did you let the kids come up with their own script? After some experiments, I'm thinking we need scripts that leave a few things out which the kids have to fill in to complete the script. Many kids tend to freeze when they see the camera blinking and have a microphone in their face. It doesn't seem to work "free-style" for us ....or does it for you? 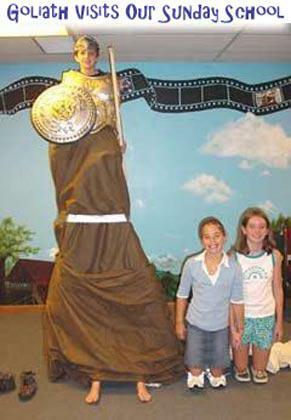 We have used a tv news show as a reinforcement tool for Vacation Bible School for the past three years. The "news" was scripted. An overhead projector was a very acceptable teleprompter so the kids could read their lines while looking in the direction of the camera. Particularly successful was the "joke of the day," which the kids selected from various Biblical joke books we have in our library. Because we have no editing capabilities, a single take was very important and the script was critical for making that happen. We didn't use scripts for our video, but I see the wisdom in doing so. Some of them did really well, but some needed a bit of prompting, and others were just silly at times. We're going to do the healing of the ten lepers with this workshop this year. I was thinking we'd have them interview the ones who did not return to thank Jesus and ask them why they had not done so. Then we'll have a panel of viewers who hold up cards giving each leper a score of one through five according to how good they think the excuses are. They are then given an opportunity to tell why they give their particular score. Does this make sense to you? I saw Doug Adams (professor at the Pacific School of Religion) do this live, and it was quite effective. I think you could do something like this with a number of stories without extensive scripting. I got this interesting book called "Camcorder tricks and special effects" by Michael Stavros. It's full of neat ideas. For example: to create the effect of the newsperson at the anchor desk "talking" live to the in the field reporter, use a mirror on the wall behind and to one side of the anchorman. The "in the field" reporter stands in front of the mirror and talks to the anchor. The camera is focused on the anchor and the mirror. The anchor turns to look at the mirror. They talk just like on real news shows! Here's a fun idea when videotaping (or just doing drama) ... foreign films! You know when you watch a movie that's originally filmed in another language and they dub in English ... and how bad (and hilarious!) it can be?! We've done this a couple times and it's a riot! Assign parts for the actors and the same parts for a second group of kids as the readers who will be off camera/off stage. The workshop leader reads the narrator parts which also include the stage directions built into the script ... "Jesus said ..." or "The woman asked ...". That way the actors know their cue to start moving their mouths and the readers know when to read their lines. The actors just move their mouths and because they don't know what the reader is going to read, it looks really funny! Of course you need kids who can read to read the lines, but we've also done it where the younger kids have all the acting parts and the workshop leaders and shepherds read the lines. This is quite a hoot! Especially if you have a crowd of people who talk (all their mouths are going different directions!) or if you have a male reader reading/talking for a female actor's lines or vice versa. We've also done it with kids acting and parents as the readers and vice versa. Too funny! Notice the movable director's style chairs, lighting stands, and background/props stored behind the set. 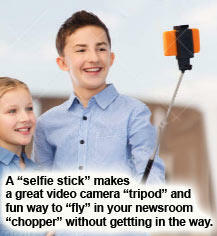 Using an iPhone or other smartphone as your newsroom video camera? See Rotation.org's instructions on "How to plug in your smartphone to a large TV screen or computer monitor."